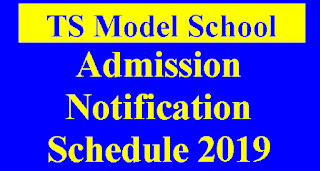 Commissioner and Director Of school Education Telangana State, Hyderabad Released A Proceeding on 19-01-2019 For Telangana State Model School Admission Schedule. 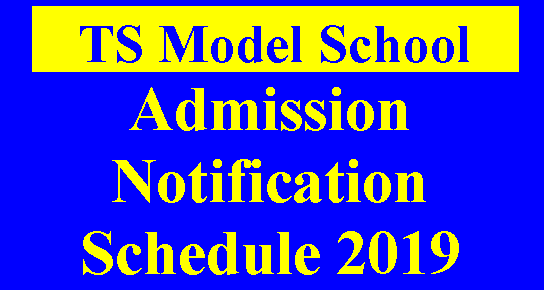 Admission Test for admission in VI class and For vacant seat of VII to X classes in Telangana State Model School(TSMS) for The Academic Year 2019-20. VII Class - Candidate should have completed 11 years of age as on 31st August of the Academic year 2019-20 in which he/she is seeking admission. VIII Class - Candidate should have completed 12 years of age as on 31st August of the Academic year 2019-20 in which he/she is seeking admission. IX Class - Candidate should have completed 13 years of age as on 31st August of the Academic year 2019-20 in which he/she is seeking admission. X Class - Candidate should have completed 14 years of age as on 31st August of the Academic year 2019-20 in which he/she is seeking admission.